HONG KONG, October 13, 2009 - Aki Ra's story is, perhaps, not an uncommon one in Cambodia, where land mines have wreaked havoc on a nation of 14 million people. At age five, Aki Ra lost his parents to land mines and went to live in the jungle with other children who'd suffered a similar fate. At age 12, he was forced by the Khmer Rouge to join their army. The former child soldier recalls how some friends made fatal mistakes in handling live ammunition. Their bodies were simply discarded into a river and washed downstream. After three decades of conflict, Cambodia has one of the worst land mine problems in the world. They were scattered across the country,and once embedded can remain active for up to half a century. “Landmines are not designed to kill. They are designed to maim,” says Bill Morse, who works with Aki Ra. After a peace settlement was brokered in 1991, the United Nations was given a mandate to enforce a ceasefire and deal with disarmament in Cambodia. There are an estimated three to 10 million land mines still left in the country, although experts put the figure at five million. Inspired by the UN's work, Aki Ra has been devoting his time to clearing land mines. Between 1990 and 2005, he has de-commissioned about 50,000 devices with just a knife, without any protective equipment. 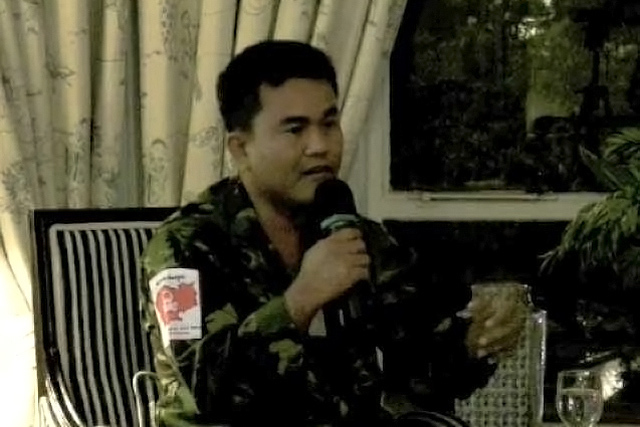 In 1997, Aki Ra went on to establish the Cambodia Land Mine Museum and now works with a team of 10 men in the field. His wife and six-year-old son are also adept at de-mining. Aki Ra spends 25 days a month clearing the land while the remainder of the time is devoted to the museum. Residing at the museum alongside his family are 25 children, bearing the scars of a country ravaged by conflict. There, he provides the former street children with more than just shelter - it is their home. It is difficult to quantify how many land mines are de-commissioned. “Some days we clear a dozen, some days none. But we clear a lot of land. The first village we cleared was outside Siem Reap. 25 families are now farming that land. A year ago it was killing people,” said Bill Morse. For more information on Aki Ra and his work: http://www.cambodialandminemuseum.org.